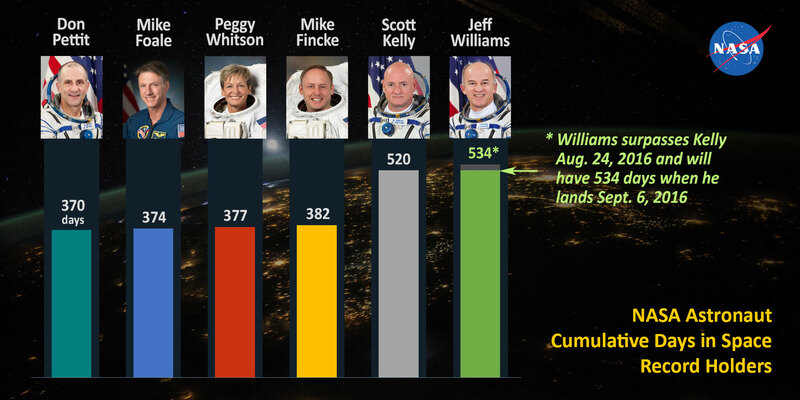 Astronaut Jeff Williams surpassed former astronaut Scott Kelly’s record today for the most cumulative days in space by a NASA astronaut. Expedition 48 Commander Jeff Williams established a new record for most time spent in space by a NASA astronaut today, surpassing 520 days in space over his four missions. Williams will have a total of 534 cumulative days by the time he lands Sept. 6 in Kazakhstan. Former astronaut Scott Kelly had set the record on his year-long mission, and still holds the record for longest single spaceflight by a NASA astronaut at 340 days. The International Space Station raised its orbit today ahead of Williams’ departure Sept. 6 with cosmonauts Oleg Skripochka and Alexey Ovchinin. After the trio undocks in their Soyuz TMA-20M spacecraft, ending Expedition 48, they will parachute to a landing in Kazakhstan about 3-1/2 hours later. SpaceX’s Dragon will depart the station first early Friday morning for a splashdown in Pacific Ocean off the coast of Baja California. Williams and Flight Engineer Kate Rubins continue loading Dragon with gear and science samples for analysis on Earth. Rubins and Japanese astronaut Takuya Onishi will be at the controls of the robotics workstation when they command the Canadarm2 to release Dragon at 6:10 a.m. EDT Friday.